Albuquerque’s Build With Robots LLC (BWR) sees automation and human labor existing side by side, even in small and medium-sized businesses. The New Mexico company works with manufacturers and other businesses to enhance their productivity and competitive advantage by incorporating “collaborative robots,” or CoBots, into the labor force to perform the more monotonous tasks so people can work where they are most valuable. “Fill seasonal demand or vacancies,” BWR suggests on its website. “Off-load dangerous or dirty jobs. Free up your team to do more rewarding and higher-value work.” CoBots, the company stresses, augment rather than replace human resources. Two years ago, NM MEP teamed up with BWR to offer CoBot seminars and hands-on CoBot application demonstrations. The first such event was in late 2017 at San Juan College’s Quality Center for Business in Farmington. As NM MEP works on building New Mexico’s manufacturing sector, we’re helping companies transition to advanced automation. Business owners must include workers in this admittedly disruptive process, because people know which aspects of the job waste time and resources and where efficiencies can be found. This holistic approach can make it easier for companies to recognize the money they can save by delegating machine tending, welding, packaging and other repetitive tasks to a machine that is less likely to make mistakes and more likely to consistently spot product defects. And people are more open to changes like this if it means they have more opportunities to learn advanced skills that use their brains and develop their talents — and when they realize CoBots enable their employers to compete against larger, wealthier players. Large, industrial robots and machines cost more than most small New Mexico businesses can pay, but they’re also not necessary for many of the tasks that medium-volume or high-mix manufacturers need the machines to perform. CoBots are relatively affordable, require little maintenance over their working lives and require little training to learn. 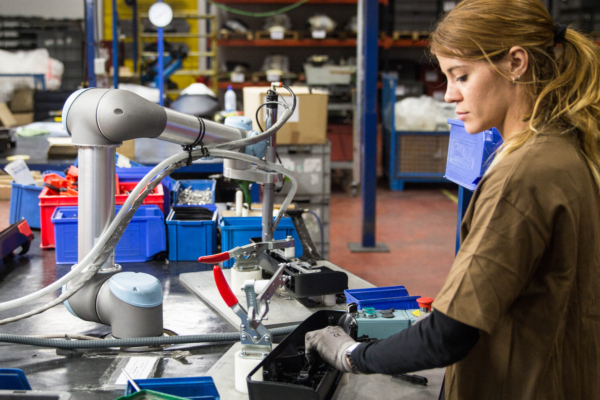 And, because they can be programmed to perform different movements for multiple tasks, CoBots are more versatile than stationary robots that perform only one task on an assembly line. Most weigh less than 80 pounds, which makes them easy to move where they’re needed, and they take up little space, which means production layouts don’t have to change radically from one job to the next. Most CoBots can safely share a work space with humans and dramatically reduce the stress injuries that come with repetitive tasks. The International Organization of Standardization (ISO) and American National Standards Institute first published formal safety guidelines for robots in 2016, and those standards continue to evolve. Future CoBot seminars and demos will be announced in upcoming newsletters. For now, NM MEP is offering instruction in Automation Mapping and Lean Cell Design, in addition to our on-site business consulting and “Lean” workshops. For more information, call (505) 262-0921 or email us at info@newmexicomep.org.